V is an interpretation of Vivaldi's Concerto for Violin in F Minor, Op. 8, No. 4, RV297, "Winter", I. Allegro non molto. You can hear a traditional version of it on the iTunes Music Store. A shorter and slightly re-arranged version of V appears in DanceDanceRevolution EXTREME as V ～for EXTREME～. 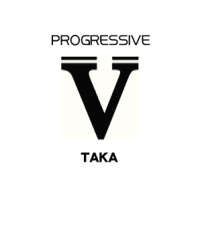 A longer and re-arranged version of V, titled V -conclusion-, can be found on dj TAKA's first album, milestone. This version has the traditional score originally written by Vivaldi. A short version of V -conclusion- can be found in beatmania IIDX 16 EMPRESS, under the title V₂. A downtempo version of V remixed by QUADRA, titled V -The point of your sight MIX-, can be found on the beatmania IIDX SUPER BEST BOX SET bonus disc. TIEFSEE, a song produced by SOUND HOLIC and dj TAKA, also features piano excerpt from Concerto for Violin in F Minor, Op. 8, No. 4, RV297, "Winter", I. Allegro non molto. Another remix of Concerto for Violin in F Minor, Op. 8, No. 4, RV297, "Winter", I. Allegro non molto by Remo-con vs. dj TAKA, titled Konzert V, can be found in beatmania IIDX 23 copula. 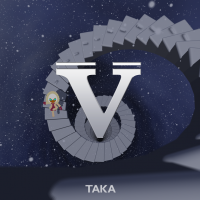 TAKA himself is the man in the live-action portions of V's video, as reveled by VJ GYO on the official beatmania 5th style website's Q&A, despite his trying to keep it a secret. V has appeared on ten beatmania IIDX CS versions (5th~10th, beatmania (2006), HAPPY SKY CS, EMPRESS + PREMIUM BEST, and INFINITAS), since it debuted. This has caused quite a bit of frustration among the beatmania IIDX community in both the USA and Japan, and has become an inside joke. beatmania IIDX 11 IIDX RED CS was the first CS beatmania IIDX game since V's debut in which it did not appear. At the time of its release, V's Single ANOTHER chart had the most notes of any Single Play chart, at 1519 notes. This would not be topped until AA's Single ANOTHER chart in beatmania IIDX 11 IIDX RED, at 1834 notes. Retroactively, V is the first beatmania IIDX song to have a Level 12 chart in Single Play mode. V received a new BEGINNER chart in beatmania IIDX 11 IIDX RED. V is one of the Left outdoors' stage unlocks of pop'n music 16 PARTY♪'s Atsumare! pop'n PARTY♪ (あつまれ！ポップンパーティー♪) event. It could be unlocked from July 2nd, 2008. From August 6th, 2008, it is available by default. V has the highest rated Battle HYPER chart (43) of all the songs new to pop'n music 16 PARTY♪. V's TRAN does not have a 2P color. V received a Double ANOTHER chart in beatmania IIDX 16 EMPRESS. V is one of the bistro saucer Final Set unlocks of jubeat saucer. It could be unlocked from January 1st to March 2nd, 2014. With 896 notes, V's ADVANCED chart has the third highest number of notes for an ADVANCED chart in the jubeat series. V could be unlocked in REFLEC BEAT groovin'!! Upper as part of the 10th Set (dj TAKA's SELECTION) of the BEMANI MUSIC FOCUS unlock system. It could be unlocked after unlocking GUILTY, ♥Love²シュガ→♥ and Lucy. Its SPECIAL chart could be unlocked via the BEMANI MUSIC FOCUS event as well after unlocking the SPECIAL charts for the aforementioned 10th Set songs. With 1014 notes, V's SPECIAL chart had the highest number of notes out of all Level 11 charts in the REFLEC BEAT series (pre-REFLEC BEAT 悠久のリフレシア). V received an EASY chart in pop'n music éclale on December 21st, 2015. V was added to beatmania IIDX INFINITAS as part of the January 2016 Basic Subscription Monthly Songs. On May 18th, 2016, it became unlockable through the Akashic Explore event for players who did not already have it. From November 2016, it can be purchased with BITs. After being removed from the initial release of REFLEC BEAT 悠久のリフレシア, V was revived on March 23rd, 2017. V's EASY chart was re-rated in pop'n music うさぎと猫と少年の夢 on March 29th, 2017. V could be unlocked in MÚSECA 1+1/2 on May 26th, 2017, as part of the Premium Friday (プレミアムフライデー) event. It could be unlocked permanently by playing it once when it appears on the last Friday of the month after unlocking I'm so Happy for normal play. It was available by default from August 9th to 31st, 2017 as well. Its Green chart is available by default from June 26th, 2018 for MÚSECA 1+1/2 machines with an offline kit (its Orange and Red charts have to be unlocked with COLORIS, though). V's Red chart has the most notes of any MÚSECA chart, with 1293 notes. V is one of the unlocks of the POLICY BREAK event. For more information on the dates it can be unlocked in the SOUND VOLTEX series, please see the event page. beatmania IIDX to 10th style difficulty rated from 1 to 7+ (up to 9th style) or 8 (10th style), from 1 to 8+ in IIDX RED, and from 1 to 12 from HAPPY SKY onwards. beatmania (2006) difficulty rated from 1 to 10. MÚSECA difficulty rated from 1 to 15. SOUND VOLTEX difficulty rated from 1 to 20 from IV HEAVENLY HAVEN onwards. EASY chart: total notes: 136. Universe stage Have a good dream. This page was last edited on 3 March 2019, at 17:58.